JEFFERSON COUNTY - An unauthorized group spent much of Tuesday morning unveiling their political message by way of a huge sign on Table Mountain. The group of 65 adults and children was forced to remove the material after going up early in the morning to put up the sign. 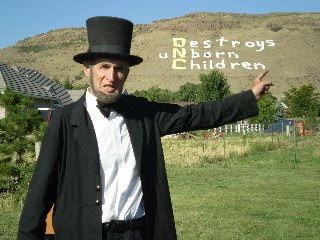 The sign's layout is similar to a crossword puzzle and read vertically, "DNC" and then horizontally, "Destroys, Unborn, Children." Dozens of 9NEWS viewers called to alert us about the massive protest sign. The Jefferson County Sheriff's Department says the protestors hiked up Table Mountain with backpacks carrying 2,500 sheets sewed together. When deputies first approached the group, they were suffering from both the heat and the altitude. Deputies and Open Space Rangers allowed the protestors to hike down the mountain to get water before they had to hike back up and remove the sign. The protestors had to get their own water and deputies say water was not provided to them. They were not cited, but did violate two open space regulations of not applying for a special activity permit and going into a restricted and closed area that is considered sensitive to wildlife. Reports say the protestors were with American Right to Life Action.